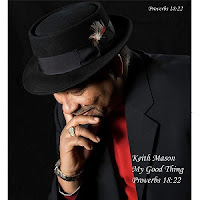 Para este lunes hemos elegido para la portada el nuevo trabajo del bajista norteamericano Keith Mason, My Good Thing. En esta edición hemos compartido juntos la música de: Keith Mason, Billy Cobham and Novecento, Patti Austin and Jeff Berlin, Bennett B, Tom Browne, The Jazzinvaders, Al Castellana, Claudio Tuma, Klaus Doldinger's Passport feat. Sasha, The Doggett Brothers, Beggar and Co feat. The Funk Jazz Collective, Matt Marshak y J. Billups.